28/02/2018: Since November 2016 there has been a decline in the number of drifting buoy observations available in the ICOADS near-real-time data stream that we use to update HadSST3. This decline is due to a switch in message coding with data from the new BUFR format not currently being decoded. As of January 2018, we now obtain drifting buoy data from ERDDAP (external web page). These data replace the drifting buoy data in ICOADS and are passed through the regular quality control procedures. 08/04/2016: An error in the format of some of the ascii files was brought to our attention by John McLean. Maps of numbers of observations and measurement and sampling uncertainties provided in ascii format ran from south to north rather than north to south as described in the data format. This has now been fixed. In some cases, the number of observations in a grid cell exceeded 9999 and were replaced by a series of asterisks in the ascii files. This too has been fixed with numbers of observations now represented as integers between 0, indicating no data, and 9,999,999, indicating lots of data. The Met Office Hadley Centre's sea surface temperature data set, HadSST3 is a monthly global field of SST on a 5° latitude by 5° longitude grid from 1850 to date. The data have been adjusted to minimise the effects of changes in instrumentation throughout the record. The data set is presented as a set of interchangeable realisations that capture the temporal and spatial characteristics of the estimated uncertainties in the biases. The data are neither interpolated nor variance adjusted. The data set runs from 1850 to 2012 and regular monthly updates will be added. 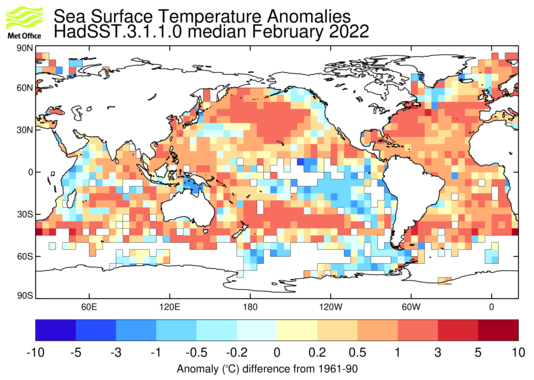 The SST data are taken from version 2.5 of the International Comprehensive Ocean-Atmosphere Data Set, ICOADS (external web page), from 1850 to 2006 and on GTS observations from 2007 onwards. From January 2018, these are supplemented by drifting buoy observations taken from ERDDAP (external web page). HadSST3 is produced (a slightly more detailed description) by taking in-situ measurements of SST from ships and buoys, rejecting measurements that fail quality checks, converting the measurements to anomalies by subtracting climatological values from the measurements, and calculating a robust average of the resulting anomalies on a 5° by 5° degree monthly grid. After gridding the anomalies, bias adjustments are applied to reduce the effects of spurious trends caused by changes in SST measuring practices. The uncertainties due to under-sampling and measurement error have been calculated for the gridded monthly data as have the uncertainties on the bias adjustments following the procedures described in the paper. For a detailed description of the dataset and its production process, please read the papers (part 1 and part 2) describing the data set. We recommended you read both papers before using the data. Discussion of uncertainties in SST data. HadSST3 at the NCAR Climate Data Guide (external link).